The 2018 Nobel Prize in Physiology or Medicine was jointly awarded to James P. Allison and Tasuku Honjo for their discovery of cancer therapy by inhibition of negative immune regulation. Both worked in parallel to unleash the inherent ability of our immune system to attack tumour cells and established an entirely new therapeutic principle in the fight against cancer. In both cases mice were the primary animal model that showed the potential for people. Cancer kills millions of people every year and is one of humanity’s greatest health challenges. It represents a major challenge on the global perspective. Before the ground breaking work of both Allison and Honju, there were three major pillars in the treatment of cancer: removing the tumour by surgery, eliminating it by radiation or attacking it with drugs that harmed the cancer cells. But not all cancers could be cured and the urgent need for novel therapies fuelled basic research to better understand how to defeat cancers. One area was of particular interest: could immunity be harnessed to attack cancer cells? The fundamental property of our immune system is the ability to discriminate “self” from “non-self” to attacked and eliminate invaders, be they virus or cancerous cells. Thus, for tumours to grow, they need to avoid detection. One way tumours do this is to produce molecules that can trick the immune system. Research in immunology, over the last 50 years, have revealed a number of ways whereby cancer cells can be forced to be recognized as non-self. This led to the cure of some cancers in mice and also the successful treatment of some patients. However, it was impossible to deliver an efficient, generalized therapy for clinical practice. One reason for this was the ability of many tumours to 'turn-down', or 'switch off' the immune system. The mechanism for this brake on the immune response to cancer was unknown, an important part of the puzzle was missing. Allison and Honjo showed how the brakes on the immune system could be lifted in two different but comparable ways. T cells, a type of white blood cell, are key players in our body’s defence. In the 80s, researchers discovered T cell receptors that bind to structures recognized as non-self and such interactions trigger the immune system to engage in defence. However, additional proteins on the surface of the T cells, acting as accelerators, must also be engaged to trigger a full-blown immune response. Researchers equally observed molecules with the opposite function, they instead worked like brakes on the T cells, inhibiting immune activation. This intricate balance between accelerators and brakes is essential for tight control of the immune response. It ensures that the immune system is sufficiently engaged in attacks against foreign microorganisms while avoiding the excessive activation that can lead to autoimmune destruction of healthy cells and tissues. James P. Allison studied a known protein that functions as a brake on the immune system, CTLA-4. He developed an antibody to CTLA-4 to block the immune system brake. He reasoned that the T cells would be unleashed and become more active and hopefully attack the cancer cells. The key experiment was performed in 1994. The results were spectacular. The mice treated with the anti-CTLA-4 antibody were cured from cancer, while the control mice developed large tumours. This seminal study represents the birth of a new concept for immunotherapy. Today often referred to as immune checkpoint inhibition. Allison was eager to apply it for the benefit of patients. A small biotech company took on the challenge to produce the human antibody and a few years later the first clinical trial started with 40 patients suffering from metastatic melanoma, the pigmented cancer of the skin. Some of the patients showed striking responses - the tumours shrank, and could even disappear. Such results had never been seen before in this patient group. Despite side effects, the results were positive enough to start a long series of larger trials conducted by clinical colleagues. Finally, in 2011, the first checkpoint antibody treatment, ipilimumab, was approved by the FDA for inoperable metastatic melanoma. Clinical trials have also shown some benefits of anti-CTLA-4 therapy on lung cancer or pancreatic cancer, specifically in combination with other drugs. In 1992, a few years before Allison’s discovery, Tasuku Honjo discovered PD-1, another protein expressed on the surface of T-cells. Determined to unravel its role, he meticulously explored its function in a series of elegant experiments performed over many years in his laboratory at Kyoto University. The results showed that PD-1, similar to CTLA-4, functions as a T-cell brake, but operates by a different mechanism. In addition, he identified the ligand, the molecular partner of PD1, present on antigen presenting cells and cancer cells. 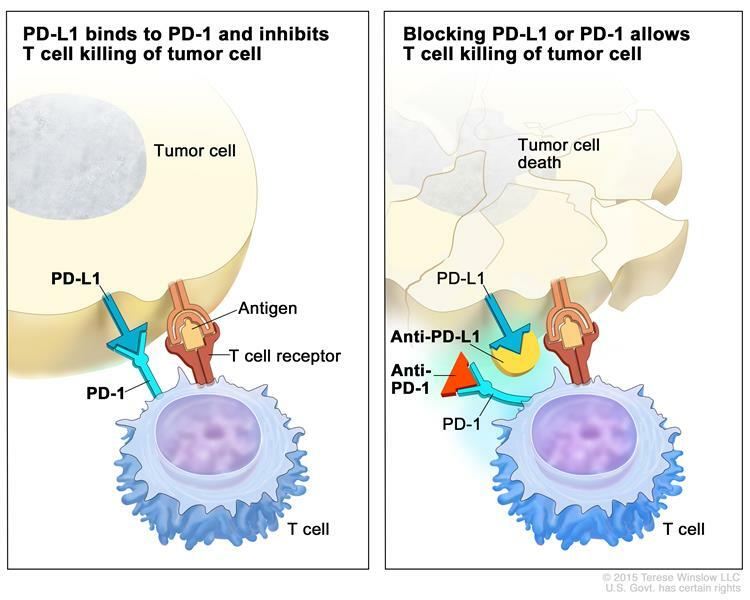 It became immediately evident to test whether blockade of PD1 could also be used to unleash T cell responses against cancer cells. Honju and other groups immediately started to gather evidence. One of the studies on melanoma spreading to the liver in mice showed that control mice developed multiple metastasis in the livers while several of the mice treated with the anti-PD-1 antibody had almost no metastasis. In this study, Honju correctly predicted that the anti-PD1 treatment might complement the anti-CTLA4 treatment since the two work by a different mechanism. He also predicted that PD1 might give less side effects. This paved the way for utilizing PD-1 as a target in the treatment of patients. Clinical development ensued, and again, similar and even more dramatic responses were noted, not only in melanoma patients. In 2012 a key study demonstrated clear efficacy in the treatment of patients with different types of cancer. Results were dramatic, leading to long-term remission and possible cure in several patients with metastatic cancer, a condition that had previously been considered essentially untreatable. The FDA approved the anti-PD1 treatment for melanoma in 2014 and for lung cancer as well as kidney cancer in 2015. Allisson’s and Honju’s discoveries have added a new pillar in cancer therapy that doesn’t target the cancer cells but rather the brakes, the checkpoints, of the host’s immune system. Their work in mice has been pivotal for the ground-breaking treatments in humans. Of the two treatment strategies, checkpoint therapy against PD-1 has proven more effective and positive results are being observed in several types of cancer, including lung cancer, renal cancer, lymphoma and melanoma. Allison and Honjo inspired efforts to combine different strategies to release the brakes on the immune system with the aim of eliminating tumour cells even more efficiently and new clinical studies, targeting both CTLA-4 and PD-1, have proved them right. After the initial studies showing the effects of CTLA-4 and PD-1 blockade, the clinical development has been dramatic. Immune checkpoint therapy has fundamentally changed the outcome for certain groups of patients with advanced cancer, despite some usually manageable side effects caused by an overactive immune response. Research now focusses on improving therapies and reducing side effects. For more than 100 years scientists had attempted to engage the immune system in the fight against cancer. Dr. Allison has received continuous funding from NIH since 1979, receiving more than $13.7 million primarily from NIH’s National Cancer Institute (NCI) and National Institute of Allergy and Infectious Diseases (NIAID), demonstrating the crucial role funding for fundamental research has on medical progress. Until the seminal discoveries by these two laureates, progress into clinical development was modest. But now checkpoint therapy has revolutionized cancer treatment and has fundamentally changed the way we view how cancer can be managed. The seminal discoveries made by the two laureates constitutes a shift in the landscape in the fight against cancer.